?If the objective is to increase the capacity of workers and their families to weather economic woes, an increase of P22 a day at this point is simply too little, too late,? Akbayan Representative Walden Bello said on Tuesday morning following the announcement of a P22-increase in minimum wage earners? cost of living allowance (COLA). Since the start of the year, fuel price inflation stands at a whopping 10.19 per cent. It is followed by transportation and communication prices at 7.28 per cent, while inflation of food prices has been recorded at 4.03 per cent. According to Bello, the sky-rocketing prices of basic commodities threaten to push millions of families propped up by minimum wage earners across the poverty threshold. 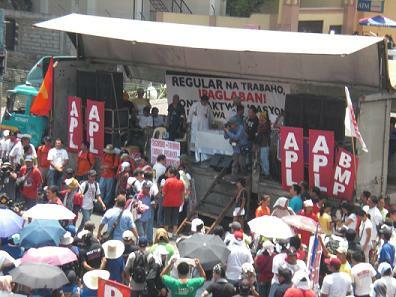 Bello also aired the call to abolish regional wage boards. The Akbayan lawmaker proposed instead that wages to be synchronized according to industry line. Bello pointed out that it is time to make the economy pro-labor, and that national development lies also in improving the wages of workers. �At a time of crisis, it is the government�s responsibility to compel employers to increase wages and provide additional benefits to meet rising costs of living and ensure that workers and their families are able to maintain a dignified life,� Bello concluded. This morning, May 10, 2011, PM picketed the Department of Labor and Employment in protest at the wage board decision. The group called for the abolition of the regional wage boards and their replacement by a National Wage Commission. �The government representatives in the wage board heard not Aquino�s call for a wage hike but the employers� plea for cheap labor. Once more the wage boards have betrayed the workers. The P22 COLA is symbolic of the wage boards� 22-years of service to the capitalists rather than the workers,� Magtubo insisted. �The COLA is a misnomer since it is supposed to bridge the gap between the take home pay and the cost of living. But the cost of living in the NCR is already P1,010 as of March for a family of six and yet the minimum wage plus COLA adds up to only P426, which is will not even buy half of the basket of goods and services,� Magtubo explained. He explained that in every wage board, the regional director of the Department of Labor and Employment chairs while two more government representatives come from the Department of Trade and Industry and the National Economic Development Authority. Two representatives each from the workers and employers complete the seven-person wage board. The Workers Create the Wealth of the Society! We Deserve Better! The Regional Wage Board�s decision of giving NCR workers a 22 pesos non-wage benefit is unacceptable and considered an insult to all non-agricultural workers. The additional Php 22 was too little to make any economic impact for the workers because it was given way too late when prices of basic commodities and transportation fares were already increased. We can say that the adjustment is really not an adjustment to help but a mere pampalubag loob (consolation). President Noynoy Aquino (PNoy) made an announcement before May 1, International Labor Day, that he has good news for the workers. But instead of making good of his promise to help alleviate a little the economic condition of the workers, he failed the expectations of the Filipino working class for the nth time. This decision and the inability of Aquino to act in favor of the majority, made it clear that Aquino�s bosses are not the ordinary people but the elites. 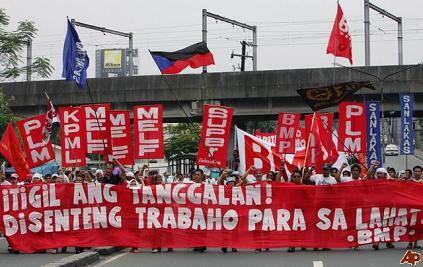 The Php 22 is not a wage increase which the workers are asking. It is way below the Php 125 or the Php 75 that the workers are asking, and is too little for a Living Wage needed by a worker to live a decent life. The Php 22 that will be added to the Cost of Living Allowance (COLA) will not be subject to over time and night differential and 13th month pay computations, making the Board�s decision more favorable to employers than the workers who badly need a salary increase. This decision is a manifestation that the ruling elite of this country is highly favored by this government. The Private Partnership Program (PPP) of Aquino is in full motion to the detriment of the working class. All those who will benefit from this shenanigan are the capitalists who are cashing in on the government�s inability to protect the interest of the working class who produces the wealth of the society. 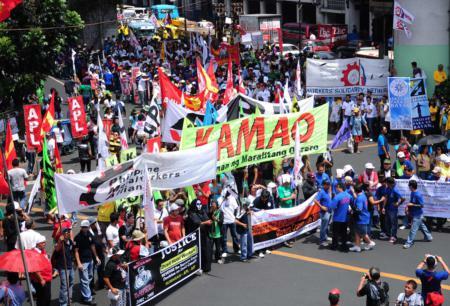 The Partido Lakas ng Masa (Party of the Laboring Masses) calls on Aquino to do something for a change, to do something to benefit the ordinary Filipino, especially the Working Class. What he needs is a political will to put forward policies that will benefit the poor majority of the society. What the workers are asking is a Php 125 salary increase, the scrapping of the Oil Deregulation Law, and the cancellation of EVAT for basic commodities! And we will not settle for anything less! Proposed P22.00 ECOLA, an insult to Filipino Workers! Proposed P22.00 ECOLA of the NCR-RWB, an alms and an insult to the Filipino Workers! The Department of Labor and Employment�s (DOLE) pronouncement of the proposed P22.00 ECOLA by the NCR-RWB (National Capital Region-Regional Wage Board) is a far cry from NEDA and NSO�s study of around P967.00 daily cost of living for family of 6 to have a decent life. The present minimum wage is pegged by the National Wage Council of only 404.00 per day in the National Capital Region. On the other hand, much lower minimum wage is being enjoyed by workers outside the Metropolis. If applied in the National Capital Region, around P563.00 is needed to cope up the daily cost of living. The P22.00 ECOLA will not be commensurate to the all time high inflation rate and the 29.2% price increases of prime commodities and basic expenses on electricity and water rates. The irony of it all is that big capitalists for the last three months were in the headlines making huge profits. In an earlier report, the top 1,000 corporations were raking in billions of pesos in profits since 2001 and were tripled in 2008 from P116 Billions in 2001 to P416.7 in 2008. Many Filipino billionaires were in fact cited in the Forbes Magazine�s Richest Men in the world. The staggering downfall of the real wage as reflected in the Consumers� Price Index (CFI) in the year 2000 data that for every peso spent of that year compared to this year, the value of P1.00 then is now pegged at P.60 Centavos. Roughly 10% will benefit the proposed additional ECOLA. In the past, loopholes in the implementation will again cropped-up because of too many exemptions and deferments. Above minimum wage earners and those employers with 10 workers and below were exempted from the proposed scheme. Not to mention those companies expected to present financial losses to enjoy some exemptions. �We find the DOLE proposal as an insult to the Filipino workers. The scheme will not alleviate the plight of the workers now wallowing in poverty. 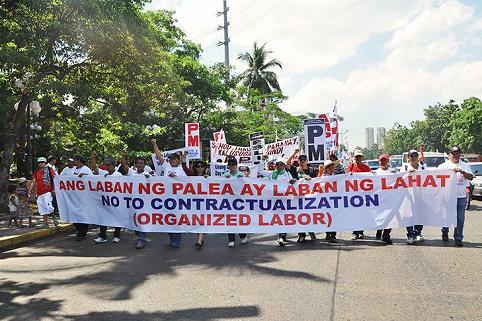 The proposal is not meant to help the helpless Filipino workers but to appease and condone the whims and caprices of the greedy capitalists.� Leody De Guzman, BMP President asserted in an interview. 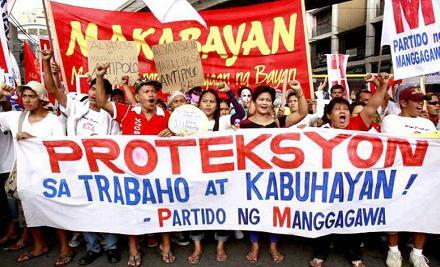 Militant labor center Bukluran ng Manggagawang Pilipino (BMP) today bewailed the recent decision of the NCR wage boards to grant an additional P22 cost-of-living allowance. �What�s worse is that this order is peppered with exemptions. Included in the exemptions are companies recently affected by natural calamities as if their workers are also exempted from the economic crisis,� he continued.